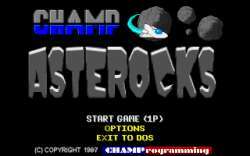 This is a DOS shareware remake of Atari's classic Asteroids arcade shooter. Like the other games in CHAMProgramming's series of arcade remakes, it closely emulates the original with two game modes, the original "Classic" and the enhanced "Champ" mode (only available in the registered version). The "Classic" mode plays and feels much like the arcade machine, with very similar graphics, sound and gameplay - which probably needn't be discussed here. You also have the option to switch between the original vector graphics and bitmapped color graphics. The "Champ" mode is an upgraded version of the classic game, featuring new more asteroids, mines that home in when near enough, shields instead of the hyperspace features and bosses - you can only have the bitmap graphics here. Finally, the game features a variety of options -- one or two player modes, three difficulty settings, adjustable game speed, input by keyboard, mouse or joystick (Champ even released a "Champ cable" that allowed you to play the game with digital joysticks), and a high score table to round it all off. It was later made freeware.